How much does Comic Con cost? 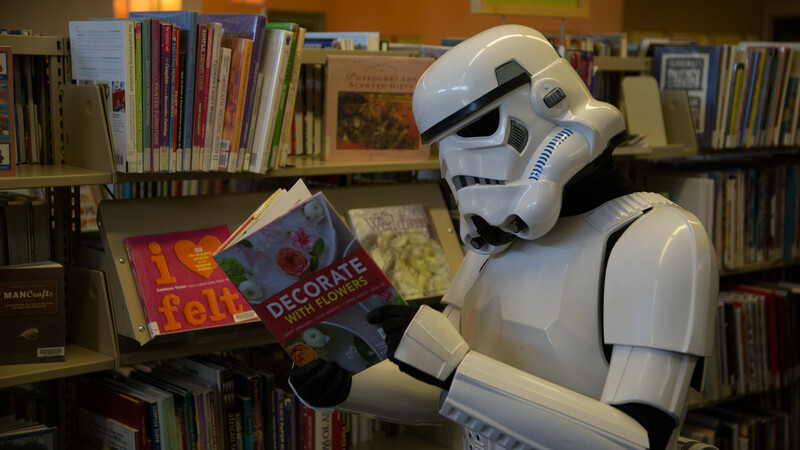 A stormtrooper takes a reading break at a past Mesa County Libraries Comic Con. Catch up with the stormtroopers of the 501st Legion this Saturday, Oct. 7, during the library Comic Con at Two Rivers Convention Center in Grand Junction. There is no admission charge to get into the Mesa County Libraries Comic Con this Saturday, Oct. 7, at Two Rivers Convention Center in Grand Junction. But if you plan to make a day of it, you’ll find food and merchandise available for purchase at the convention. In the Expo Hall, lots of awesome things will be for sale by local and regional artists, authors, crafters, and collectors. A list of exhibitors is available on the Comic Con web page. No outside food or drink is allowed in Two Rivers Convention Center. However, the concession stand at Two Rivers will be selling food and snacks, including Yoda Wraps, Gotham’s Bat Wings, and Jurassic Nachos. There are also many great restaurants within walking distance. We hope to see you at Mesa County Libraries Comic Con, 9 a.m.-5 p.m. Saturday, Oct. 7!